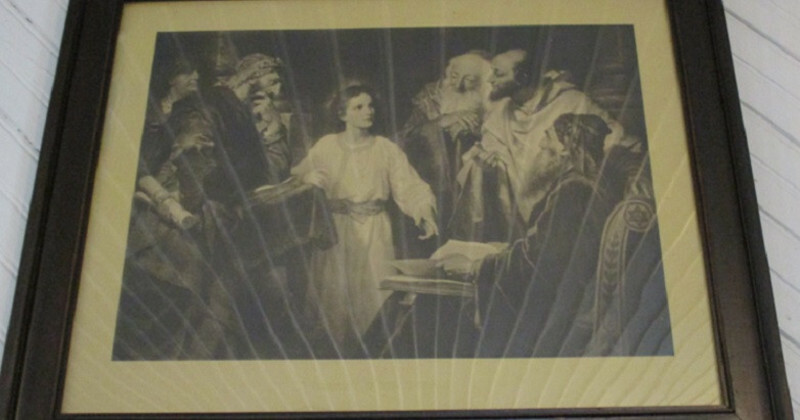 I recently saw this picture of 12-year-old Jesus in the Temple while I was visiting Pioneer Village in Minden, Nebraska. What grabbed me about this picture was the scribe on the right side, sitting on what looks like an antique school desk. The picture was displayed in Pioneer Village’s country schoolhouse. It puts the junior-high-aged Jesus squarely in the teacher’s place, and puts the Temple scribes in the place where we all belong, in the learner’s seat. Is this event for real, or is it legend? And how did it come to happen? Let’s take a look at both of these questions. Here in Luke we have the first words of Jesus recorded anywhere in the Gospels. In Mark, he does not speak until after his wilderness retreat, while in Matthew and John he first speaks around the time he meets John the Baptist. Mary is our only source for this scene from the year before Jesus’ bar-mitzvah. While it is only found in one source, this scene meets the criterion of embarrassment on two counts: his parents’ lack of understanding, and the fact that Joseph is called “your father” (and both are called “his parents”). A few Old Latin manuscripts (along with Greek manuscripts A and C, plus the Syriac version, which reads “we”) try to correct the language here, because it appears to contradict the Virgin Birth. Note also that there is no animosity toward Jewish leaders in this passage. The authenticity of this account is convincing. The passage gives us our first tantalizing glimpse of Jesus’ divine self-consciousness. Jesus says he must be (literally) “in the things of my Father”, which translators render as either “my Father’s business” or “my Father’s dwelling-place(s)”. Raymond Brown (in The Birth of the Messiah) cites two verses in the Septuagint and a quote from Josephus as evidence for the meaning “dwelling-place.” The Syriac version and the early church writers support this translation. Jesus does not explicitly say “I and the Father are one,” but at this early age, he does express the sense that he has a unique relationship with God, one that puts him in a class by himself. So how does Jesus manage to stay in the Temple, while his family leaves to return home? Joseph and Mary need not be judged as bad parents to believe that they could easily lose track of him on such a mass pilgrimage. But Kara Powell (author of Sticky Faith) raises the question: Who took Jesus in and took care of him on the Jerusalem end? Who recognized that here’s a kid without his family, and took action to provide for that need? How does Jesus get to where the leading Jewish teachers discover his astonishing insights into God’s word? There’s a part of us all that rejoices to see this 12-year-old youngster teaching the class, while the world’s teachers are compelled to sit at their desks and learn from him. But we need to remember that we must sit down and learn as well. Because whatever wisdom exists in this world, ultimately comes from him.